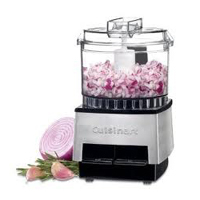 If you’re looking for a compact, no-fuss food processor, you’ll be pleased with this Cuisinart mini model in sleek black chrome. Only eight inches tall, it nevertheless chops and minces small portions of food quite efficiently. You’ll just have a little prep work beforehand, cutting large food items into smaller pieces before feeding it into the processor. The motor works fine as long as you don’t run it for too long, and we could actually feel some power behind it because we held the top down as it worked. For just $29.95, this is an efficient little worker ideal for couples or small families.